There is a huge selection of covers and cases for the iPhone 4 now available on the market. Sometimes it’s quite difficult to choose the one that will meet your taste and needs. On a daily basis we try to find the best case for you, and this time our suggestion is a Hard Candy Bubble Slider case for iPhone 4. Made to fit the dimensions of your iPhone 4, and the iPhone 4S as well, the Bubble Slider case is fully functional. This hard case provides maximum protection to the iPhone 4 from scratches, since it is made of poly-carbonate with metallic finish while the interior is lined with a shock absorbing rubber material. From the aesthetic point of view, the Slider Series Chrome Collection cases are characterized by a bright and shiny surface finish of chromium metal. 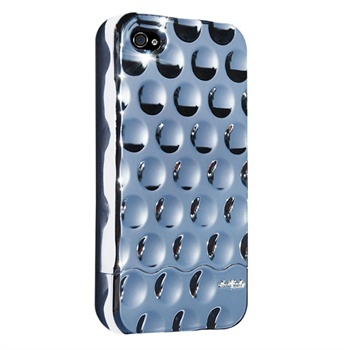 The “bubble” design makes this iPhone 4 case secure to grip, creating a sort of anti-slip surface, while helping to reduce the appearance of any fingerprints that are “obscured” by the bubbles themselves. Your smartphone will be safe in this piece of iPhone 4 accessories, and since the Chrome collection is available in three colors- black, gold and silver, and it will add a touch of sophistication to your phone. With Bubble Slider Hard Candy Cases you will definitely be noticed wherever you go. This entry was posted in Uncategorized and tagged iPhone 4 Accessories, iPhone 4 Case, iPhone 4 Cover, Smartphone Accessories. Bookmark the permalink.